Mariangela and her husband shared their beautiful home and their gracious personalities with us for several hours while we two couples prepared and ate a delicious meal under Mariangela's guidance. This experience was a highlight of our visit to Mattera -- we were able to taste both the cuisine and the culture with a local family, and to learn more about the sassi from people who had grown up with intimate knowledge of it. 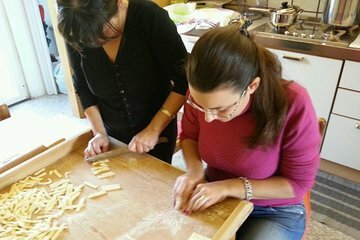 We had lots of fun and left with recipes for continuing our Italian experiences back at home. Highly recommend this experience!